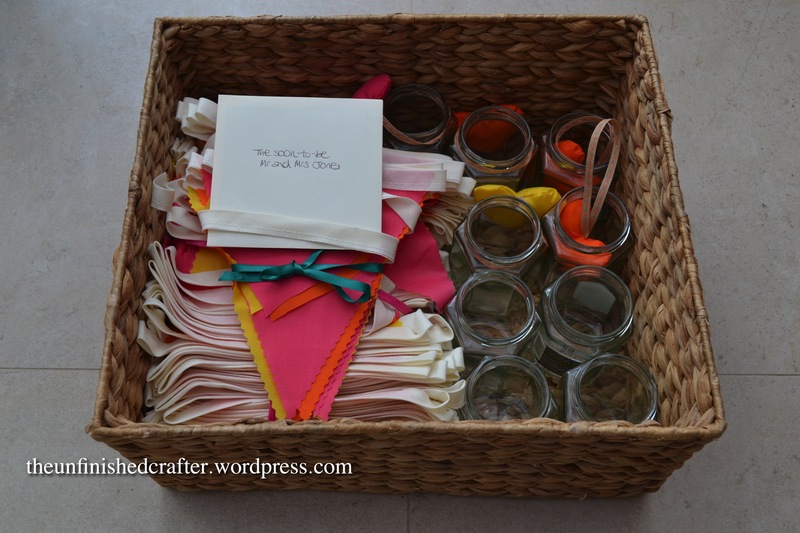 My mad crafting came to an end as it was my friend’s wedding last Saturday (15th Aug). It was a frantic week or so leading up to it, trying to finish everything off, but I’m pleased to say I did. I even met my goal of finishing the bunting by the end of July. I packaged up what I like to call ‘a wedding box of loveliness’, which my parents very kindly hand-delivered to my friend the week before her wedding. It contained delights such as THE bunting that I’ve spent months making. I was working towards 120 metres, but ran out of flags way before then, so I reckon it was a mere 90 metres or so instead. 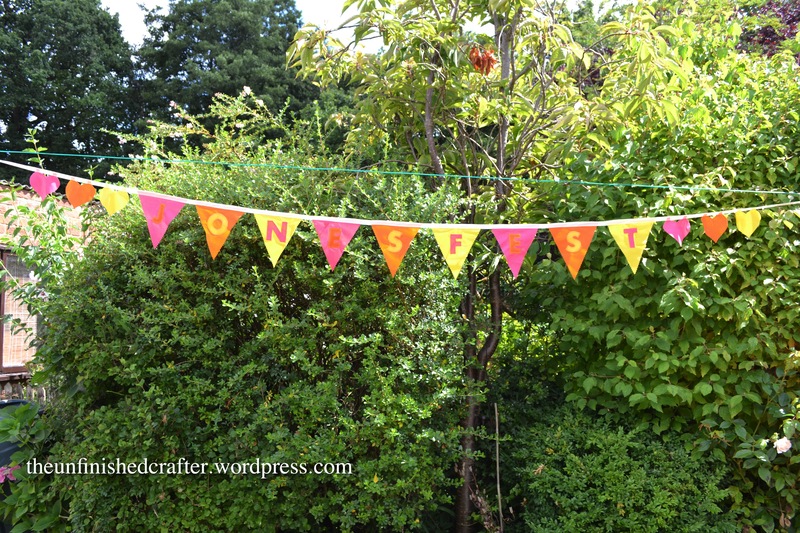 Personalised bunting. 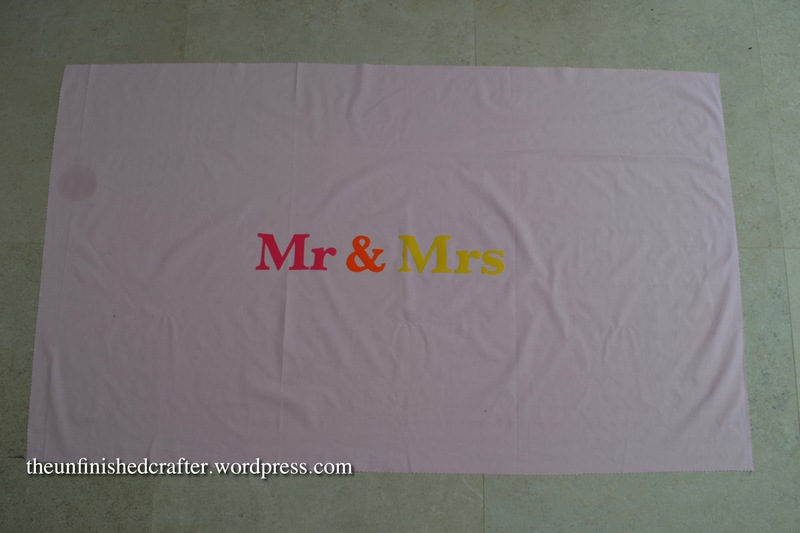 The wedding was festival themed; the Mr and Mrs-to-be would be Mr & Mrs Jones. 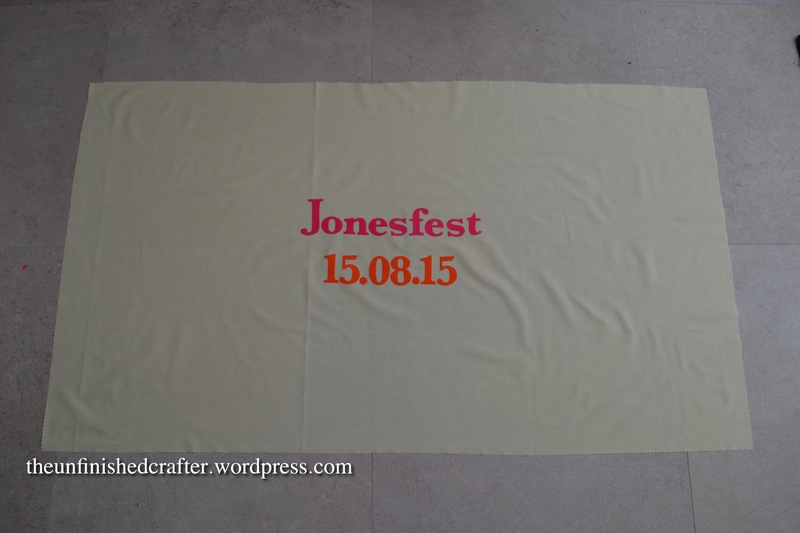 So, Jonesfest was born. Festival-themed weddings are all the rage in the UK at the moment. 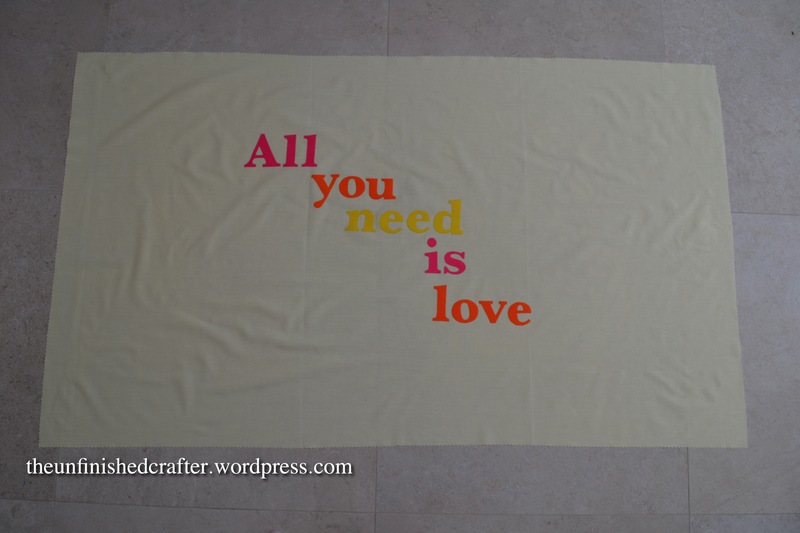 I used leftover fabric from the bunting and appliquéd the letters onto the flags, using contrasting colours (pink, orange or yellow). 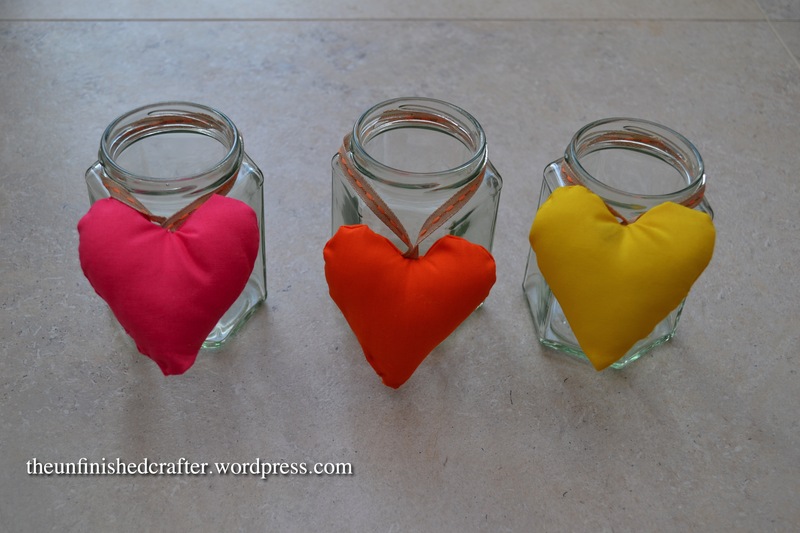 I used some more leftover fabric scraps from the bunting to make heart decorations to hang around the jars the bride wanted to use for flowers. Finally, I made 6 hay bale covers. 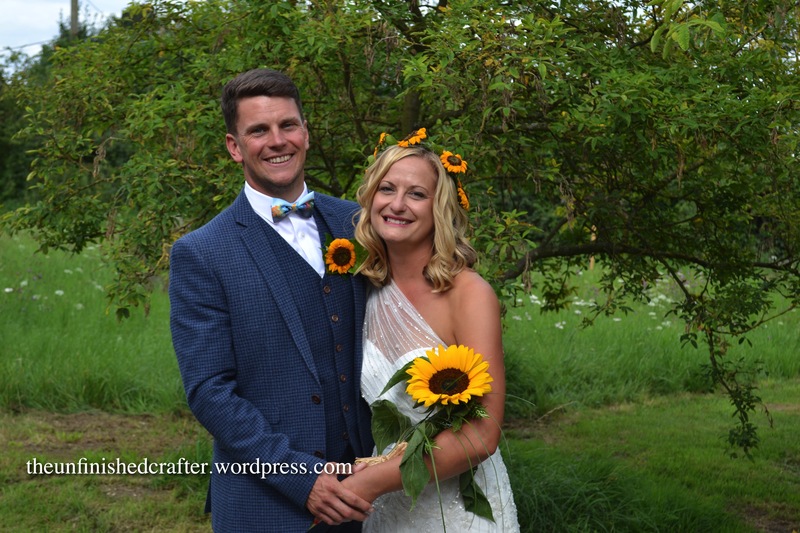 As this was a festival-themed wedding, and the brief was ‘informal and fun’ the happy couple opted for hay bale seating – no formal table plan, no sit-down meal. And I have to say, on the day, it didn’t feel like anything was ‘missing’ in that respect. It only added to the relaxed and friendly vibe. Months ago. 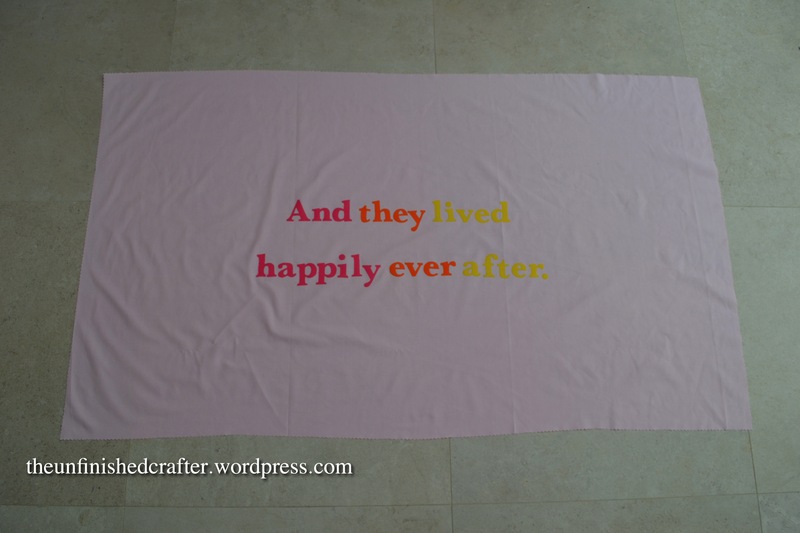 I bought a few double sheets from a charity shop, two yellow, one pink. 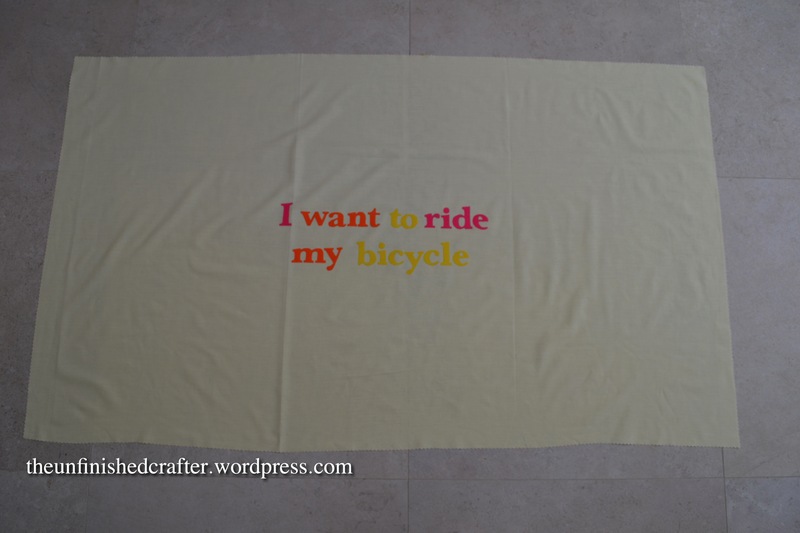 With the intention of making hay bale covers. 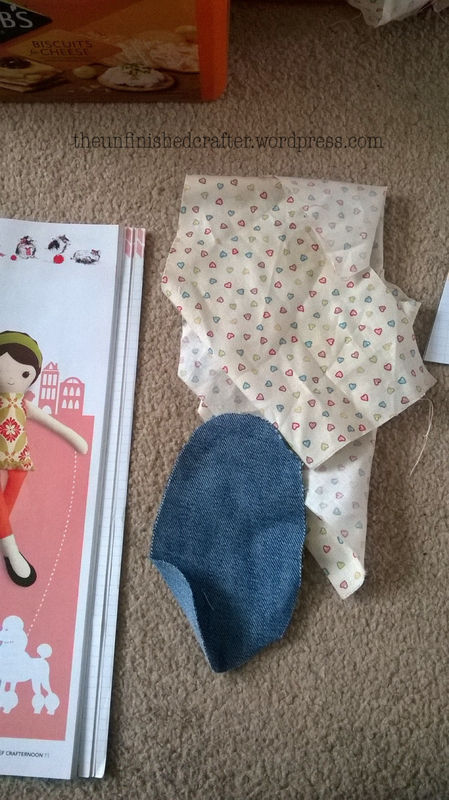 I went for the ‘no sew’ option, which basically involved cutting them into the required rectangular size using my trusting pinking blade on my rotary cutter. 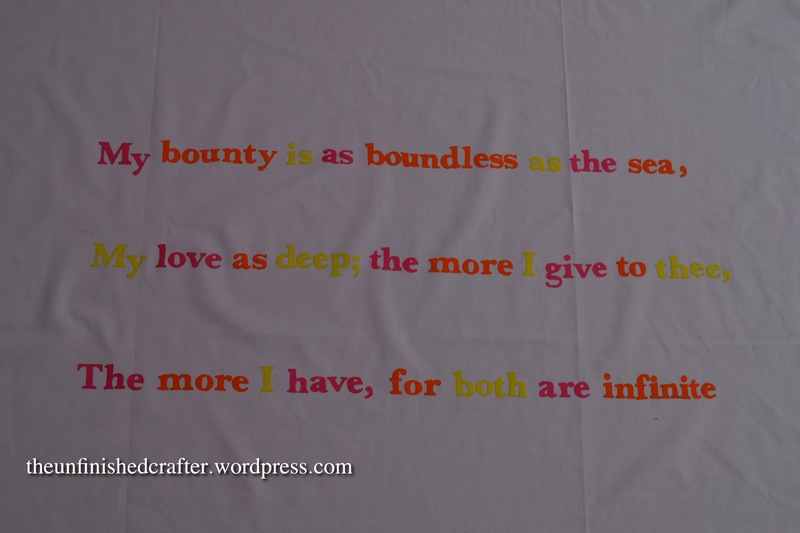 I then used up more leftover fabric scraps from the bunting by tracing letters onto bondaweb, cutting them out and ironing them onto the sheets, to create phrases. I was going to appliqué round the edges of the letters, but time was against me and I actually thought they looked nice as they were. My iron needed a clean after every session with the bondaweb. Thank god for my iron cleaner stick. I was one of six bridesmaids at the wedding. 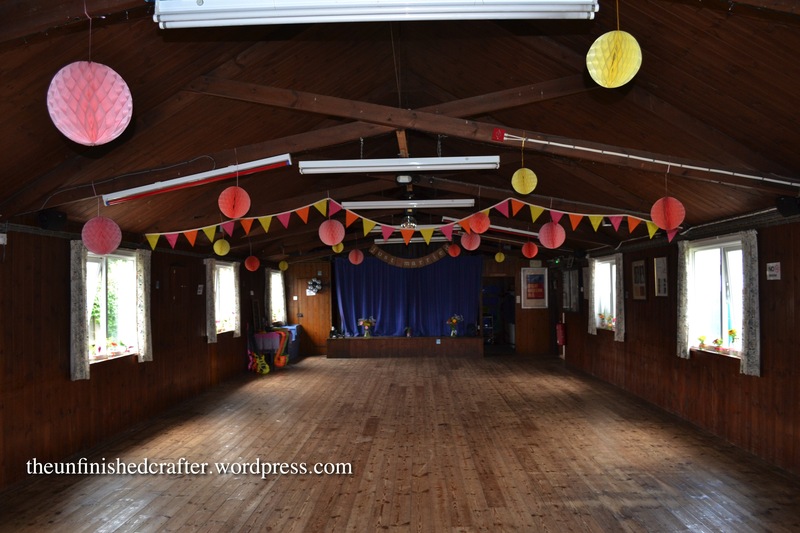 We all assembled for our duties on Thursday night/Friday morning and had a lovely day on Friday decorating the village hall and the fields behind, both of which were to be used for the wedding reception. As luck would have it, there was exactly enough bunting! 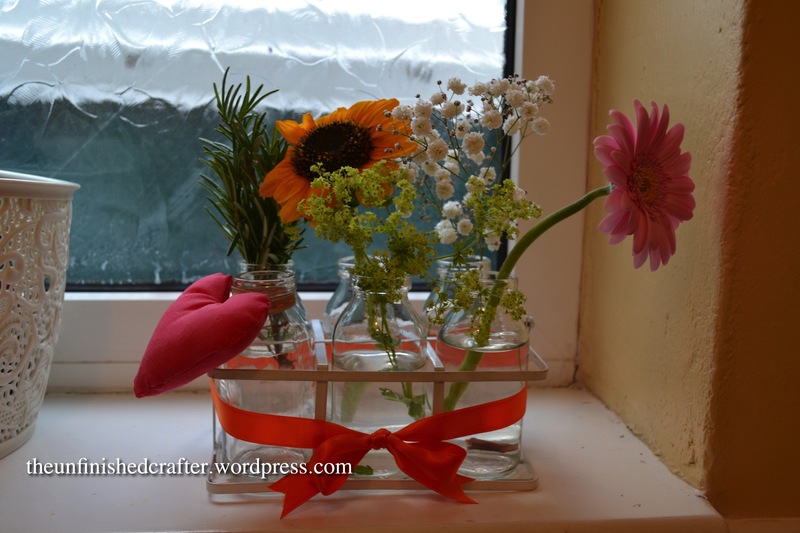 Myself and one of the other bridesmaids had a productive couple of hours decorating jars and milk bottles with ribbon and lace, before arranging flowers in them. it really did look lovely once we’d finished. On the day itself, we walked from the bride’s house to the village church, stopping for various photo opportunities on the way. After the church service, we all walked down to the village hall where a Ceilidh band was in full swing ready for our arrival. Instead of a wedding cake, the newlyweds had invited guests to bake a cake to be entered into ‘The Great Jonesfest Bake-Off’, which was to be judged by the Best Men. Our bridesmaids dresses were all different, which looked really good. The only rules were that they needed to be knee-length, chiffon and in one of three colours: fuchsia, watermelon or daffodil. Having ordered my dress when I wasn’t pregnant, I ended up panic-buying a second dress a month or two ago, thinking that I wouldn’t fit in my ‘normal’ dress when the time came. As it happened, I did. But I did switch into my maternity dress in the evening, which was more comfortable by that time in the day. Breaking with convention again (well in the UK, at least), the bride had asked each of the bridesmaids to prepare a speech. Very nerve-wracking considering there were 200 guests. 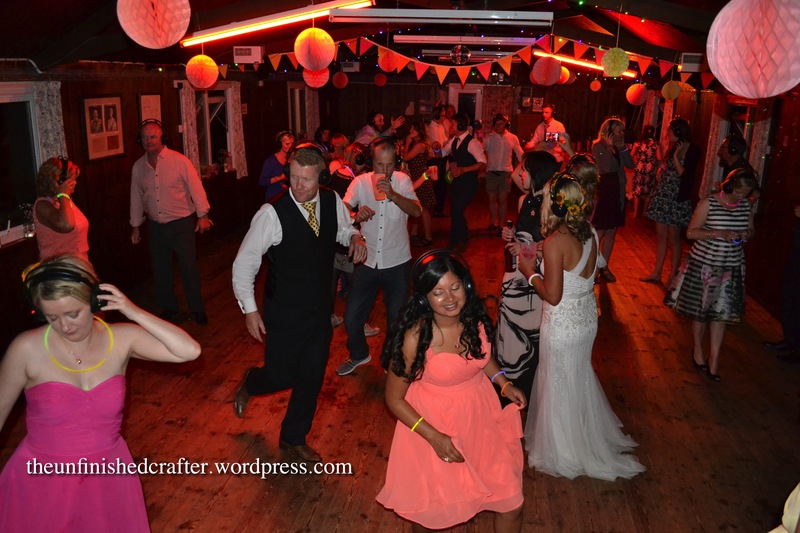 But, with the Ceilidh dancing beforehand, we didn’t have too much time to get nervous and it was a wonderful feeling once it was over and done with. Here’s a photo of us with the happy couple (I’m the blonde one in yellow). The day ended with a silent disco. For those not familiar with the concept, it’s when everyone wears a pair of headphones so that you can dance to music, without disturbing others. 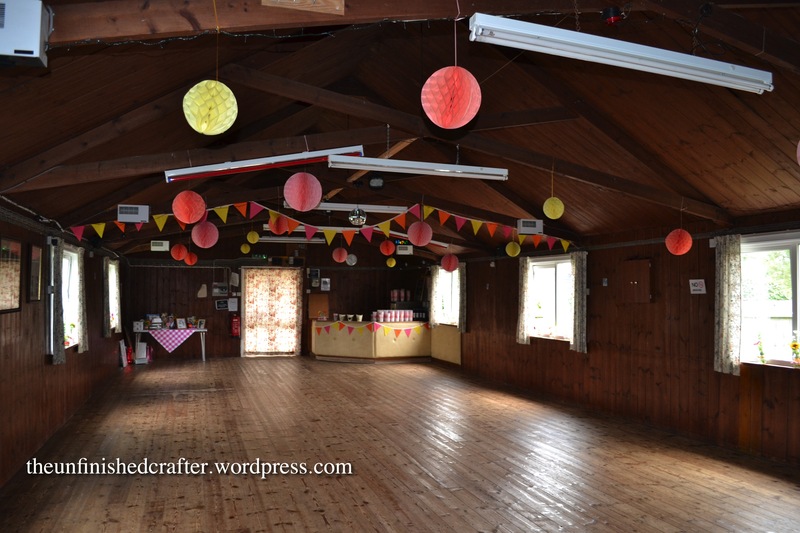 A good option for a village hall wedding reception like this, where the rule was no noise after 10pm. In this case, there were three channels to choose from on the headphones: the groom’s playlist, the bride’s playlist and the people’s playlist (songs requested by the wedding guests in their RSVP). The bride mentioned to me that they’re now using the hay bale covers I made on the beds in their home. 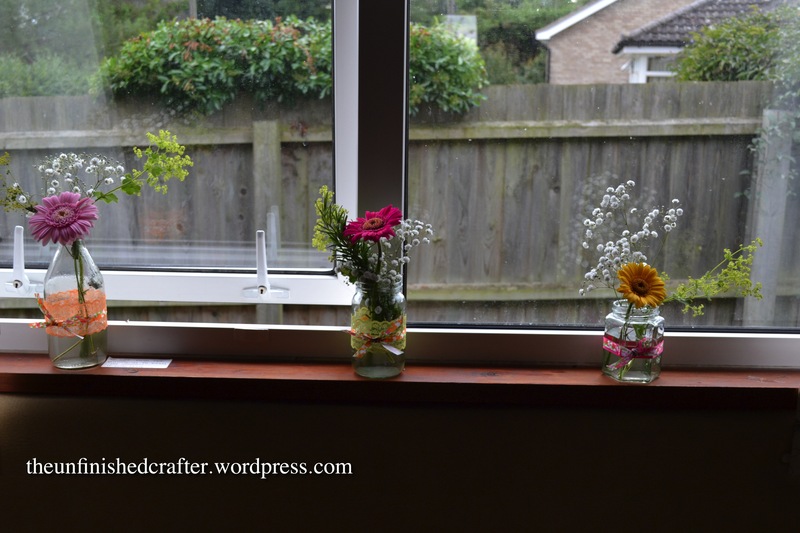 Which cemented in my mind a little idea i’d had – which was to turn them into a quilt! New project alert! I’d actually had a little something else in mind, to use up more of the leftover bunting scraps, but I’m going to try and incorporate this into the quilt. I’ll have to wait until October until I get the hay bale covers back, so plenty of time to come up with ideas how to do this. I’ll leave you with a photo of the new Mr and Mrs Jones! 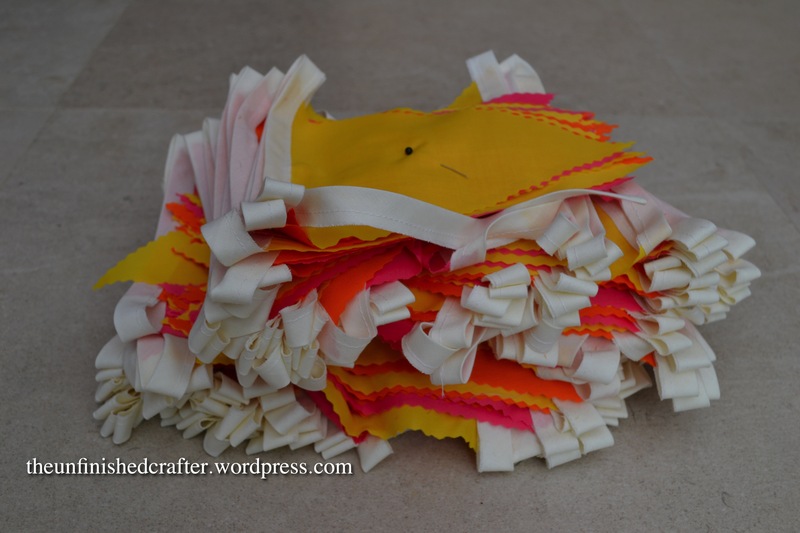 I’ve now cut out 419 flags for the bunting for my friend’s wedding. I’m one of her six bridesmaids. 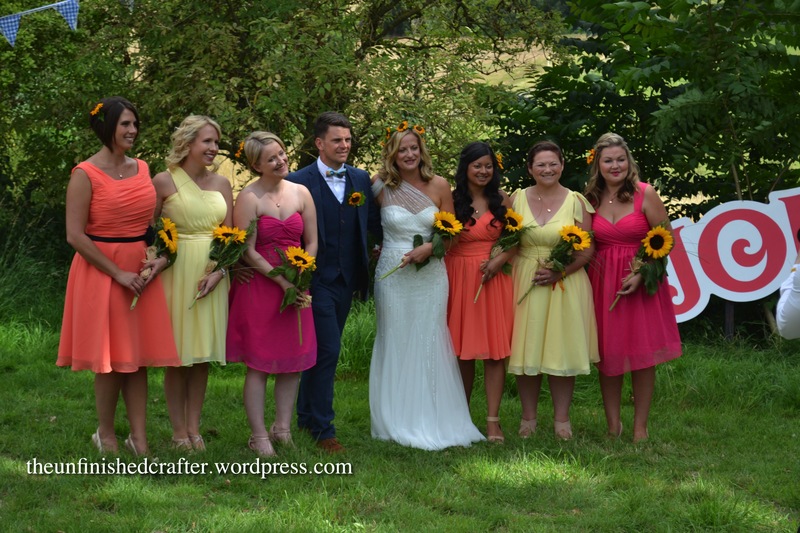 Her colour theme is ‘sunset’ and the six of us are all wearing different dresses, two in each colour: coral/orange, fushia and daffodil. I think it’ll look great. So, I finally got around to using my new toy, the pinking blade I bought for my rotary cutter. 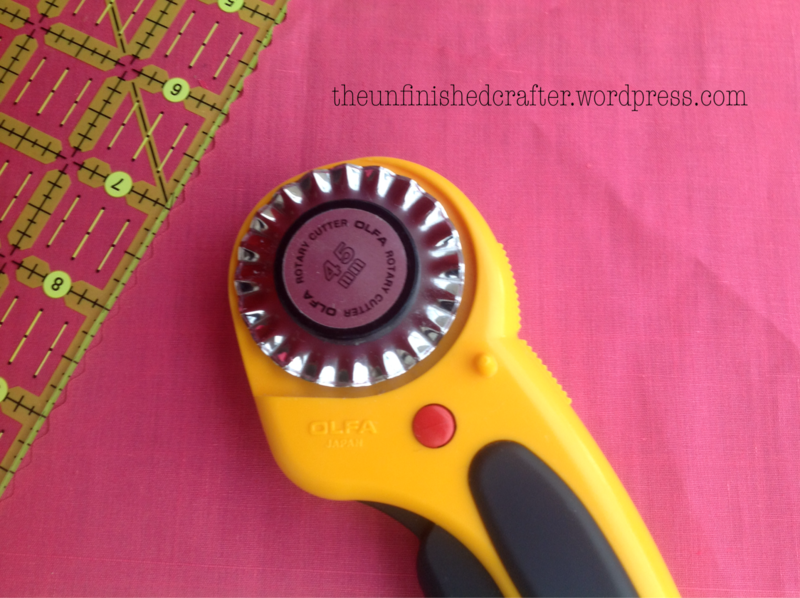 Once I was up and running, I was cutting through 4 layers of fabric at a time. So it hasn’t taken me long to do. 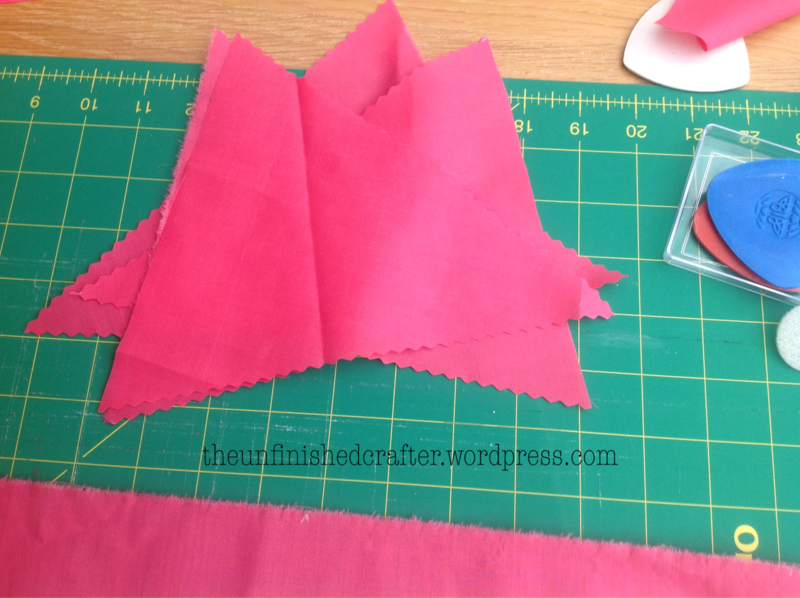 MUCH quicker than cutting by hand with pinking shears. 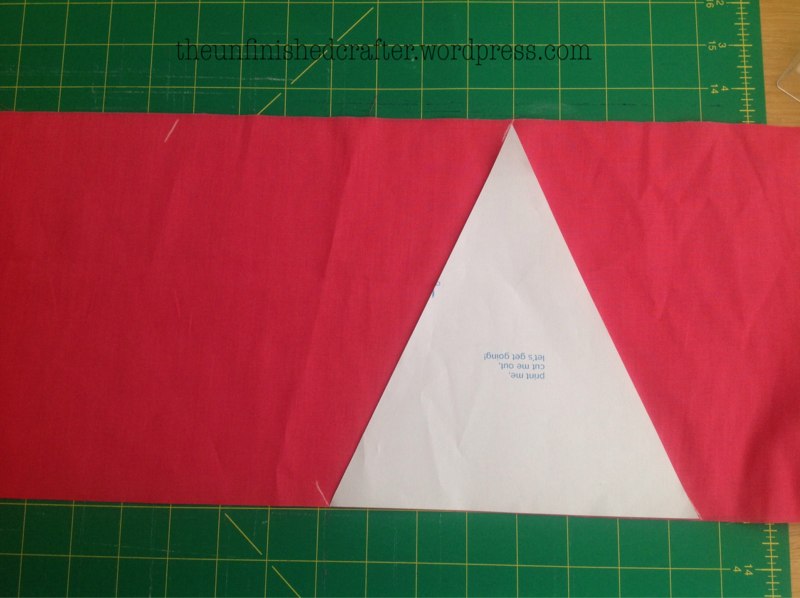 I cut the fabric into 8″ strips, then marked the points of the triangles using tailor’s chalk. No messing around with washable fabric pen this time. I switched to a different bunting template, which left me with 419 flags in total, instead of the 426 I’d calculated. Work has stopped while I await the arrival of my ebay bargain – a job lot of 120 metres of bias binding for £10! But having discovered Laura Hunter’s Facebook page, I’m now overwhelmed by possibilities … Pretty dress or ballerina outfit … Decisions, decisions. This week, I’ve also finally embraced Instagram. Better late than never, hey?! You can follow me here, I hope. I’m playing around with watermarking my photos, having found that some of my photos are coming up in Google image searches now. I know opinions are divided over doing this, but I read a very compelling argument for doing it here.